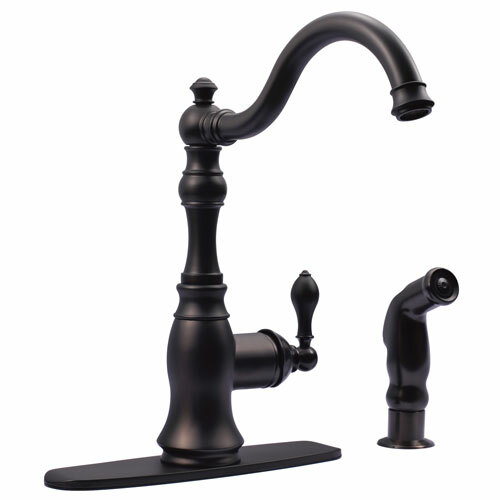 Kingston Oil Rubbed Bronze Single Handle Kitchen Faucet w Sprayer GS7705ACLSP: This Single Handle Kitchen Faucet w Brass Sprayer is built to last. The highest quality standards are used to precision manufacturer a top of the line product. Important features of this BRAND NEW Fixture: Complete Item! Everything necessary for installation is included. - Solid Metal Lever Handle - Matching Accessories Available - Easy to Install - Installation instructions included - Single Handle Kitchen Faucet w Brass Sprayer - High Quality Brass Construction - Matching Side Spray Included - Stylish Single Lever Handle - Optional Deck Plate - Spout Height: 12.5-inch - Spout Reach: 9.5-inch - Oil Rubbed Bronze premier finish designed to resist fading and tarnishing. This fixture is manufactured by Kingston Brass and is part of their precision Designed Plumbing Fixture collection. Awesome seller! Great packing and FAST shipping I love my purchase! :smiley:5 stars! !